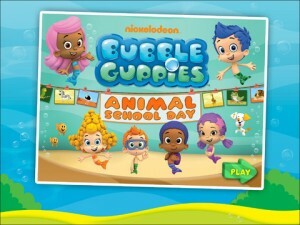 Bubble Guppies: Animal School Day HD Review – This school is an underwater zoo! My kids ask me all the time if they can bring one of our three dogs into preschool for show and tell. The answer is always no, mainly because our dogs are only slightly better behaved than wild monkeys. So they have to settle for bringing their Care Bears and toy trains, which are monumentally less exciting than a real pet. Bubble Guppies: Animal School Day is like a dream come true, and doesn’t help my case when arguing the advantages of presenting a 100-pound yellow lab to a classroom of giddy two-year-olds. 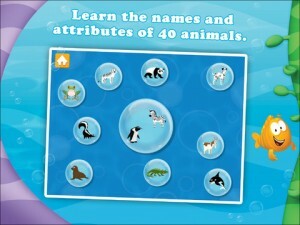 The app is very fun while being chock full of animal facts and educational tidbits. Based on the animated television show by the same name (“Bubble Guppies”), the classroom setting helps prepare preschoolers for “real” school while introducing new concepts about the animal world. The app is easy to navigate, the educational aspect is clearly presented and age-appropriate. Both kids enjoyed playing the games and could do so quite independently. 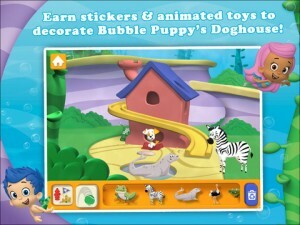 However, Nickelodeon tends to overprice their apps and Animal School Day seems to continue that trend. Personally I think the $4.99 price tag is a little steep, even as a gift for the most ardent of Bubble Guppies fans. – This app is certainly not cheap!